Hope This Helps You: Wrap Gifts in Burlap! Just outside the yarn, fabric and scrub stores in Divisoria, along Tabora, are sellers of giveaways and wedding paraphernalia. One can get sinamay from them as well as woven baskets, wooden rings and these burlap sacks. This was the smallest and cost P25. They also have burlap bags (like a mailman bag) and you can also get burlap fabric at P90/yard (should you want to use it stretched on a frame). 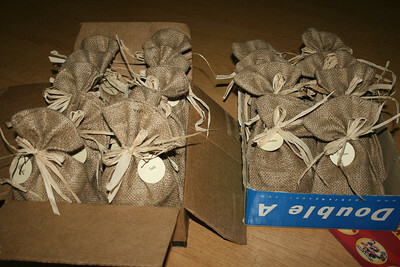 You will be given a choice of hemp string/cord or these dried straws to complete your packaging requirements. I like how this lends a very organic feel to gifts, plus it's perfectly reusable as a container for marbles or other trinkets.